24th of June 2016 – The Federation Française de Rugby’s new stadium project reached another exciting milestone today, with the signing of the contract between the FFR and the developer and main contractor, Ibelys. The contract was signed at a ceremony in Paris by the President of the FFR, Pierre Camou, and BESIX Europe General Manager, Jean Polet. The on-site ceremony, at the former racecourse of Ris-Orangis to the south of Paris, also saw the French Prime Minister, Manuel Valls, sign a Contrat d’Interet National; an administrative arrangement that will give priority and state support to the Populous-designed project. 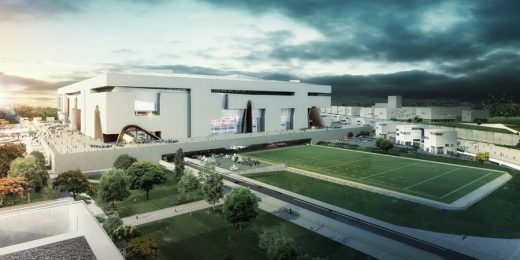 This unique, 82,000-capacity venue is at the heart of the FFR’s plans for a new era for French rugby. The ground will be much more than a stadium. The stadium will be at the heart of a new southern centrality of Paris, with a leisure development programme, shops, businesses and housing accompanying the stadium project. As well as hosting all French national team home matches, the stadium will also accommodate conventions, shows and a broad range of sporting events thanks to its multi-purpose design. 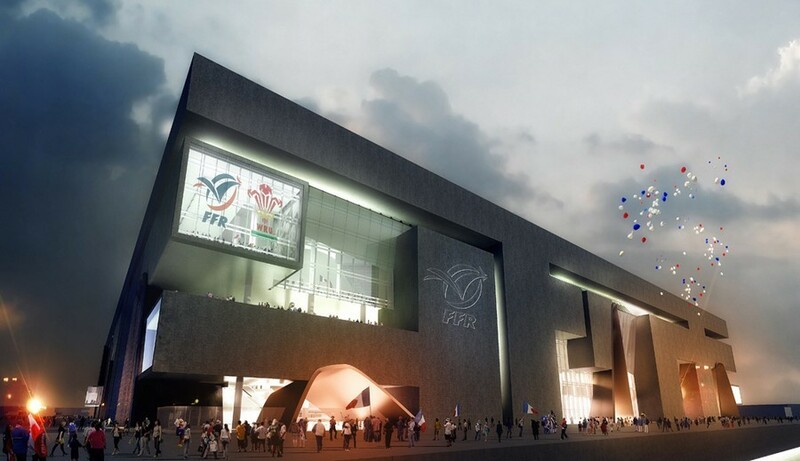 The retractable pitch will provide the FFR with the best national stadium pitch in Europe, while the retractable roof will create the largest roofed entertainment venue in the continent, delivering an incredibly intense atmosphere, and allowing matches and events to take place throughout the year. The next stage of the project will now begin, with the submission of a planning application, supported by the local authority, Communauté d’Agglomération Grand Paris Sud (CAGPS), who are a key partner in the project. Populous is a global architecture and design firm that designs the places where people love to be together, like Yankee Stadium, the London Olympics, and the Super Bowl. Over the last 30 years, the firm has designed more than 2,000 projects worth $40 billion across emerging and established markets. Populous’ comprehensive services include architecture, interior design, event planning and overlay, branded environments, wayfinding and graphics, planning and urban design, landscape architecture, aviation and transport design, hotels and hospitality, and sustainable design consulting. Populous has 17 offices on four continents with regional centres in Kansas City, London and Brisbane. The Steering Committee of the French Rugby Federation (FFR) has retained the services of Populous and Ateliers 2/3/4/ for the design of the Grand Stade FFR. After several months of discussions with three competing groups, the FFR has made its choice of designers and has issued the first computer-rendered images. The FFR Grand Stade will be much more than a stadium; the 82,000 capacity venue will become the ‘national stadium of rugby’. 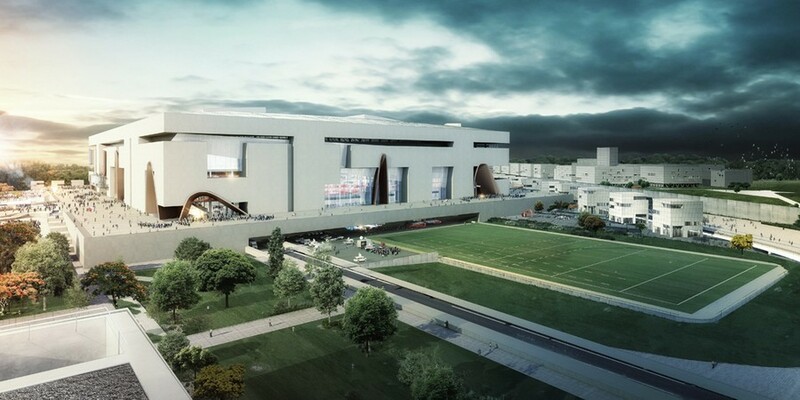 It will host all the French rugby home matches, and also accommodate conventions, shows and a broad range of sporting events thanks to its multi-purpose design. The retractable pitch will endow the FFR with the best quality pitch amongst all the major rugby stadiums in the world. The retractable roof will deliver a more intense atmosphere, it will ensure matches are played whatever the weather, and will create the largest roofed entertainment venue in Europe. Four large video boards are part of the multi-purpose facilities, allowing the broadcasting of replays and extra technical information. 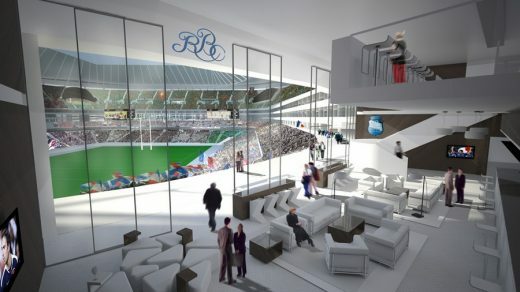 The stadium has been designed to contribute to writing the future of the Fédération Française de Rugby and of French rugby. Its architecture echoes a fortified town delivering both hospitality and protection, with white stone echoing the quarries in Baux de Provence. Within this protective venue, the Plazas des Bandas, the general admission arcades, the multi-level lounges, the corner suites and the presidential box make a variety of outstanding and unique spaces that are there to catalyse the fervors of the French rugby fans. The heart of the stadium lies under the protection of tall mineral walls and large glass windows looking onto the finely cut bowl, which will create a vibrant atmosphere. There will be between 17 to 20 events a year, including five to six games of the French national rugby team and the final of the TOP 14.